We live in an angry culture. One does not need to look hard to discover this truth. Some poor check-out clerk in a grocery store gets berated by a customer in front of everyone. Some person begins yelling at the top of their lungs at another driver who did something that was deemed “outrageous,” like driving the speed-limit instead of the flow of traffic. Politicians angrily call their opponents all kinds of evil things. Don’t forget the angry people taking guns and shooting, or angry people suing others, the angry feelings people have towards ex-spouses, the angry feelings people have towards sports referees, and on and on. The Bible has a lot to say about human anger, and most of it is not complementary. However, sincere Christians often take comfort in the theory of “righteous anger.” The assumption is, obviously, that my anger is “righteous” and therefore actually calls for no repentance on my part. To be honest, due to the overwhelmingly negative light human anger is cast in, in the Bible, I always assumed believers who called their anger “righteous” were actually joking. According to Dr. Jeffrey Gibbs, that is a mistaken assumption on my part. 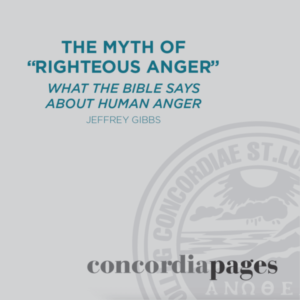 At any rate, that defense led Gibbs to conduct a study on the topic of anger back in 2015 which was published at ConcordiaTheology.org. He actually admits, in the study, that he also struggles with anger. I’m sure that means he’d love to have discovered a solid biblical foundation for “righteous” human anger. What he discovered is that, at best, human anger does not have to automatically lead to sin – it typically does but it doesn’t have to. Not surprisingly, the study generated a lot of feedback. People were shocked. “What, my anger is not righteous? You’ve got to be wrong.” A follow-up study seemed to be in order and that study was published in the Fall 2018. Below are links to both articles. Anger is real. It is not only culturally acceptable but actually promoted by our culture. These two studies are a welcome corrective to the corrosive direction anger is taking us. They are very readable. I recommend them to all.